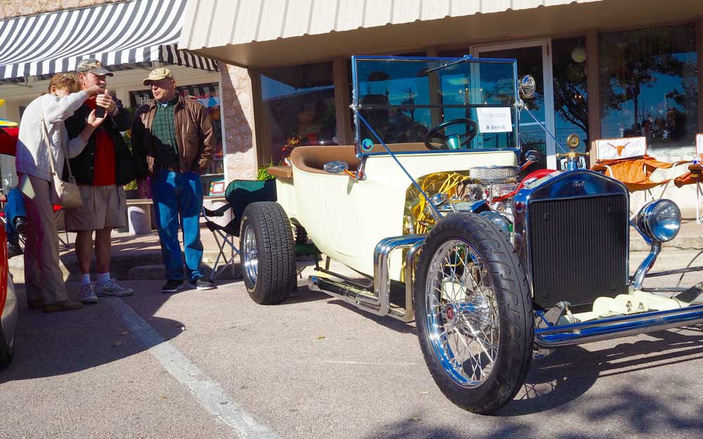 MARBLE FALLS — As September turns to October, there’s no better way to jump start the turning of the seasons than with a car show, and the Kiwanis Club of Marble Falls has one lined up. The 16th annual Main Street Car Show is 9 a.m.-3 p.m. Saturday, Oct. 7, in downtown Marble Falls. The public can admire these hot rods, classic cars, and more for free. And if you have a question, or just want to talk cars, the owners enjoy sharing every detail about their vehicles. Many of us have a weakness for classic cars and trucks. Even today, a low-rumbling engine rolling down the road catches our attention and we turn to look, hoping to catch a glimpse of a 1967 Camaro all decked out in its finest. Then, there are the hot rods — a true American original. Give a car enthusiast a chassis from a 1930s Roadster, some time, and plenty of garage space, and they’ll turn out a one-of-a-kind hot rod. You’ll find a bunch of those at the Kiwanis show. If you have a classic car or truck, hot rod, or vehicle you want to show off, there’s still time to participate in the event. Show up between 9 a.m. and noon for registration, which is $25. This will get you entered in the show, a T-shirt, a goody bag, and a chance to win one of several trophies. Give Kiwanis member Jack Sargent a shout at (830) 598-2863 or email him at jackdsargent@gmail.com with questions or for more information. The event features plenty of chances to do some shopping, eat great food at local restaurants, and listen to Dixieland Music. Last year, the Main Street Car Show brought in just over 100 vehicle entries, and probably five times as many spectators, Kiwanis officials said. They hope to top both of those numbers this year. The Kiwanis Club of Marble Falls supports several international and local programs. Locally, some of their charitable efforts are aimed at the Boys & Girls Club of the Highland Lakes, the youth baseball and softball leagues, the Marble Falls High School Key Club, and scholarships for local high school students. If you’re interested in learning more about the Kiwanis, just ask one of the members during the car show. They’ll be glad to answer your questions.